Using high-brilliance X-rays, researchers track the process that fuel cells use to produce electricity, knowledge that will help make large-scale alternative energy power systems more practical and reliable. Miniaturized fuel cells are probed with high brilliance X-rays at the Advanced Light Source at Lawrence Berkeley National Laboratory. Solar power and other sources of renewable energy can help combat global warming but they have a drawback: they don't produce energy as predictably as plants powered by oil, coal or natural gas. Solar panels only produce electricity when the sun is shining, and wind turbines are only productive when the wind is brisk. Ideally, alternative energy sources would be complemented with massive systems to store and dispense power think batteries on steroids. Reversible fuel cells have been envisioned as one such storage solution. Fuel cells use oxygen and hydrogen as fuel to create electricity; if the process were run in reverse, the fuel cells could be used to store electricity, as well. "You can use the electricity from wind or solar to split water into hydrogen and oxygen in a fuel cell operating in reverse," said William Chueh, an assistant professor of materials science and engineering at Stanford and a member of the Stanford Institute of Materials and Energy Sciences at SLAC National Accelerator Laboratory. "The hydrogen can be stored, and used later in the fuel cell to generate electricity at night or when the wind isn't blowing." But like the renewable energy sources they seek to complement, fuel cells also have a drawback: the chemical reactions that cleave water into hydrogen and oxygen or join them back together into water are not fully understood at least not to the degree of precision required to make utility-grade storage systems practical. Now Chueh, working with researchers at SLAC, Lawrence Berkeley National Laboratory and Sandia National Laboratories, has studied the chemical reactions in a fuel cell in a new and important way. 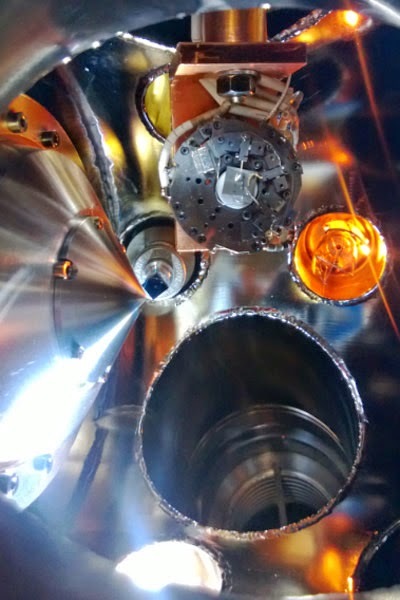 In a paper published today in Nature Communications, Chueh and his team describe how they observed the hydrogen-oxygen reaction in a specific type of high-efficiency solid-oxide fuel cell and took atomic-scale "snapshots" of this process using a particle accelerator known as a synchrotron. The knowledge gained from this first-of-its-kind analysis may lead to even more efficient fuel cells that could, in turn, make utility-scale alternative energy systems more practical. In a typical fuel cell, the anode and cathode are separated by a gas-tight membrane. Oxygen molecules are introduced at the cathode where a catalyst fractures them into negatively charged oxygen ions. These ions then make their way to the anode where they react with hydrogen molecules to form the cell's primary "waste" product: pure water. To perform both of these reactions, electrons also need to make the journey: electrons are added to the cathode and removed from the anode. Normally, the electrons are drawn to the cathode and the ions are drawn toward the anode, but while the ions pass directly through the membrane, the electrons can't penetrate it; they are forced to circumvent it via a circuit that can be harnessed to run anything from cars to power plants. Because electrons do the designated "work" of fuel cells, they are popularly perceived as the critical functioning component. But ion flow is just as important, said Chueh, a center fellow at Stanford's Precourt Institute for Energy. "Electrons and ions constitute a two-way traffic pattern in many electrochemical processes," Chueh said. "Fuel cells require the simultaneous transfer of both electrons and ions at the catalysts, and both the electron and ion 'arrows' are essential." Electron transfer in electrochemical processes such as corrosion and electroplating is relatively well understood, Chueh said, but ion flow has remained, well, opaque. That's because the environment where ion transfer may best be studied catalysts in the interior of fuel cells – is not conducive to inquiry. Solid-oxide fuel cells operate at relatively high temperatures. Certain materials are known to make superior fuel cell catalysts. Cerium oxide, or ceria, is particularly efficient. Cerium oxide fuel cells can hum along at 600 degrees Celsius, while fuel cells incorporating other catalysts must run at 800 C or more for optimal efficiency. Those 200 degrees represent a huge difference, Chueh said. "High temperatures are required for fast chemical reactivity," he said. "But, generally speaking, the higher the temperature, the quicker fuel cell components will degrade. So it's a major achievement if you can bring operating temperatures down." But while cerium oxide established itself as the gold standard for fuel cell catalysts, no one knew just why it works so well. And that paucity of data is troublesome: better understanding could lead to the fabrication of even better catalysts. What were needed were visualizations of ions flowing through catalytic materials. But you can't exactly stick an electron microscope into the pulsing, red-hot heart of a fuel cell running at full bore. "People have trying to observe these reactions for years," Chueh said. "Figuring out an effective approach was very difficult." In their Nature Communications paper, Chueh and his colleagues at Berkeley, Sandia and SLAC split water into hydrogen and oxygen (and vice versa) in a cerium oxide fuel cell. While the fuel cell was running, they applied high-brilliance X-rays produced by Berkeley Lab's Advanced Light Source to illuminate the routes the oxygen ions took in the catalyst. Access to the ALS tool and the cooperation of the staff enabled the researchers to create "snapshots" revealing just why ceria is such a superb catalytic material: it is, paradoxically, defective. "In this context, a 'defective' material is one that has a great many defects or, more specifically, missing oxygen atoms on an atomic scale," Chueh said. "For a fuel cell catalyst, that's highly desirable." Such oxygen "vacancies," he said, allow for higher reactivity and quicker ion transport, which in turn translate into an accelerated fuel cell reaction rate and higher power. "It turns out that a poor catalytic material is one where the atoms are very densely packed, like billiard balls racked for a game of eight ball," Chueh said. "That tight structure inhibits ion flow. But ions are able to exploit the abundant vacancies in ceria. We can now probe these vacancies; we can determine just how and to what degree they contribute to ion transfer. That has huge implications. When we can track what goes on in catalytic materials at the nanoscale, we can make them better and, ultimately, make better fuel cells and even batteries."